Sustainable development was a very new concept not long ago and it is now realized by action strategies and specific steps. Vietnam Business Forum has an interview with Mr. Nguyen Quang Vinh, VCCI Secretary General and Vice Chair of the Vietnam Business Council for Sustainable Development (VBCSD), one of the pioneers on forming a sustainable business ecosystem in Vietnam. Huong Ly reports. Could you please introduce remarkable achievements of sustainable development in 2018? Remarkable milestones in 2018 include the first opening of the National Conference on Sustainable Development, the continued implementation of the Program for Benchmarking and Announcing Sustainable Businesses, the establishment of the Press Network on Sustainable Development, and activities to strongly promote public-private partnerships in sustainable development. 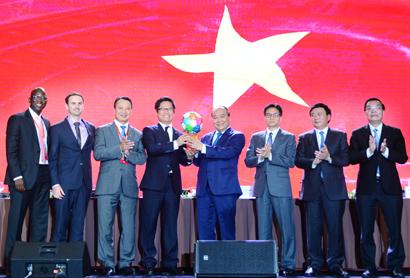 At the National Conference on Sustainable Development, Prime Minister Nguyen Xuan Phuc stressed that sustainable development is an overarching goal and a common responsibility of the political system, the whole society and each person while speaking highly of topics of discussion at the Conference and asking the Ministry of Planning and Investment to work with the Vietnam Chamber of Commerce and Industry (VCCI) and other stakeholders to draft and submit the Decree on Sustainable Development to the Prime Minister for promulgation. This is an important result of the conference. In addition, last year, VBCSD continued to work more closely with its members and well-reputed partners to effectively carry out a series of initiatives such as “SME Support Program toward Sustainable Development”, “Project on Promoting Sustainable Energy Development by Building a Sector-specific Sustainable Energy Scenario and Green Investment Guide for Financial Institutions”, “Action Program for Enhancing Integrity in Business” and co-host of the Partnering for Green Growth and the Global Goals 2030 (P4G). Particularly, in January 2018, VBCSD-VCCI officially introduced the Business Support Initiative for Circular Economy in Vietnam, aiming to take the lead in enhancing the competitiveness of the private sector, further fostering business engagement for a low-carbon economy. Two first activities of the initiative are the Zero Waste to Nature Initiative (ZWTN) to mitigate bad impacts arising from plastic wastes and the Secondary Material Market Project to utilize usable materials and curtail negative environmental impacts caused by manufacturing activities of enterprises. Three years into carrying out the Program for Benchmarking and Announcing Sustainable Businesses and the Corporate Sustainability Index (CSI), what are you most satisfied with? In the past three years, the most obvious impact of the program is a “boost” to help raise awareness and encourage the business community towards stronger sustainable development. VCCI was well aware that the business will be an important partner in realizing sustainable development goals (SDGs). The program aims to encourage and motivate the business community to implement sustainable development, turn sustainable development into a wave, a movement and gradually the ‘oxygen’ of business. Despite not being among the certified companies, program candidates already approached and applied the CSI and had an overview of their health based on very specific social, economic and environmental criteria. The inclusion of the CSI and the Program into Resolution 19 of the Government showed the government's explicit recognition of the ripple effect of the program. The CSI was also adapted to be accessible for more companies and aligned with Vietnamese laws and international practices, particularly the Global Reporting Initiative (GRI) standards. While bringing the CSI to the business community through training courses, the program attracted more than 500 candidate companies. 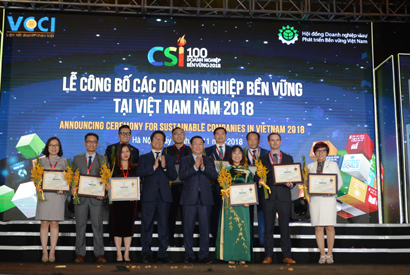 Speaking at the Announcing Ceremony of Sustainable Businesses in November, Deputy Prime Minister Vuong Dinh Hue highly appreciated VCCI's initiative in building the CSI and working with authorities to launch the CSI Program 2018. He also emphasized that CSI is a perfect complement to the Enterprise Development Index to be released annually by the Government, together with the White Paper on Vietnam Enterprise Development. In addition to the CSI, the concept of circular economy is also being disseminated. Could you tell us more about why the circular economy has become a development trend in the world? Recent studies show that the circular economy is a business opportunity worth at least US$4.5 trillion by 2030, creates hundreds of millions of new jobs and brings unprecedented competitive advantages to businesses by reducing risks arising from the scarcity of resources and the volatility of input prices and helping them adapt to new regulatory policies in the future. That is why the circular economy becomes a new option for the world business community. Many giant global brands have pioneered shifting their investment in the circular economy in Vietnam. For example, being committed to collecting, recycling and reusing 100% of plastic packaging waste from Unilever products till 2025, Unilever Vietnam took the lead in building and deploying plastic waste classification, collection and recycling in Ho Chi Minh City in 2018 and then scaling up this model nationwide. Coca-Cola also aimed to support collecting and recycling all plastic bottles from products it sells to the market by 2030. To support the business community, VCCI-VBCSD has introduced the Business Support Initiative for Circular Economy in Vietnam, with specific activities I mentioned above. As the VBCSD Vice Chair, what message would you deliver to the business community on the occasion of New Lunar Year 2019? I am sure that sustainable development is the goal that the Government, authorities, customers and investors care about. Companies should understand that sustainable development is not a burden but a business opportunity worth trillions of US dollars and hundreds of millions of jobs. The very precipitous evolution of scientific and technological achievements has changed the way we do business. Opportunities are being extended to businesses which dare to be creative, dare to search for new realms where making money does not go against or harm the environment but, on the contrary, protect the environment. It is no coincidence that, among the 17 Sustainable Development Goals (SDGs), the final but most important is promoting partnerships. Vietnam can fully develop its economy and enhance its competitiveness if the private sector partners deeper with the State sector to invest and operate infrastructure and develop key industries. That is also the reason why VBCSD has launched a series of programs and initiatives based on public-private partnership. We encourage businesses to actively seek opportunities to cooperate with partners to utilize each other's resources and strengths, thus shortening the roadmap for sustainable development for enterprises. To boost this process, VCCI has proposed the Government to issue the Law on Public Private Partnership to complete the legal and policy framework for PPP investment.